It rained yesterday, not heavy, but we are so happy ! Many of us in Malaysia were suffering from the heat , from the hot weather for the past few months. The weather is getting a bit cooler today.This morning I woke up feeling relax and happy because I have nine days holidays ahead of me ! Oh ! Now I have time to sew ! I started my first holday sewing project early in the morning. 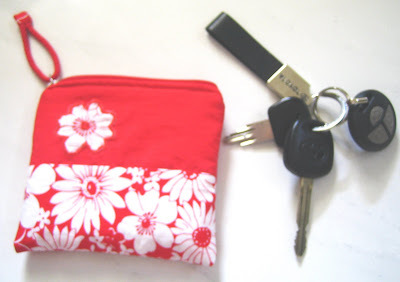 I sew a cute red and white flower purse . The sweet red and white flower fabric is 100% cotton.This is a scrap fabric left over from a dress I sew for my niece a few years back.I love this fabric so I bought a few metres and I still have 1 1/2 metres of it keep in my sewing room. A blouse to be sew using this fabric in near future.The plain red fabric was given to me by my sister . It is not cotton and I guess it is of polyester type. The purse is embellished with an appliqued flower motif I cut from the cotton fabric. I machine appliqued the flower , just as what I did for the little dress I made last time. At first I intended to use this purse for putting coins and small notes , but I found out that its size is just perfect for my car keys instead. In the end I decided to use it for this purpose so that my car keys will not jumble up with other stuff inside my handbag ! 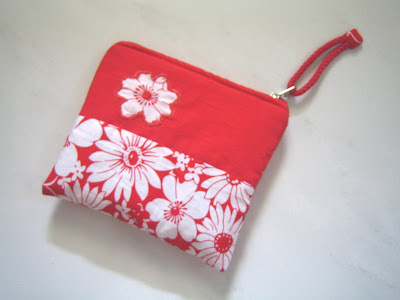 This red flower pouch is very lovely. And you are very talented to sew many beautiful clothings, such as blouse and trousers. Do you use regular sewing machine to sew clothes? or do you own a serger?? I enjoy sewing small items usually (pouches, bags, etc), but I'd love to sew clothing, too!! Hi, Chick Chick , I don’t think I am talented. Sewing is just a hobby that gives me great pleasure and release me from stress. I own a regular sewing machine and a 1-needle 3-thread overlock sewing machine. Do try sewing clothing, start with simple skirts for your girls. You can get many free patterns from Japanese sites.